Chef Ricardo Diaz's vibrant La Puente spot for tacos with a gourmet twist, plus craft cocktails. 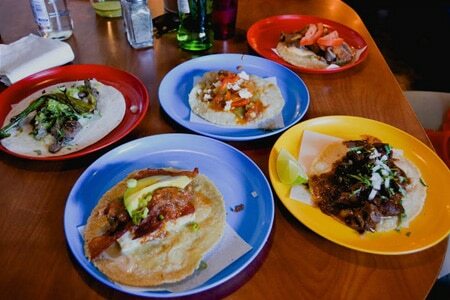 : Chef Ricardo Diaz creates, arguably, L.A.’s best tacos at this restaurant-lounge in La Puente. His other venues (Cook’s Tortas, Bizarra Capital in Whittier, and formerly, Guisados in Boyle Heights) are cult foodie favorites showcasing a balance of authentic Mexican cooking and haute technique. 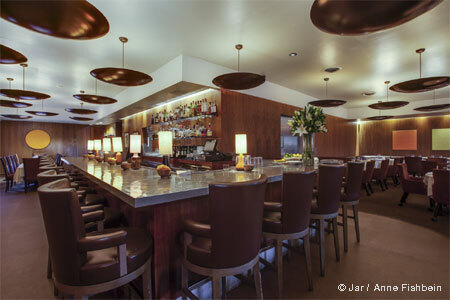 Here he teams up with brother-in-law Patrick Aguirre, who previously cooked at Bouchon in Yountville and A.O.C. Drinks are the easy part. Cocktails like a watermelon-lime margarita or a michelada are pleasant and refreshing, though not spectacular, and craft beers are well-suited to tacos, which is where things get difficult --- choosing among them, that is. Diaz’s chalkboard menu offers 15 varieties, each so unique it’s painful to decide between guisados (stewed) like duck confit with smoky guacamole, pork and kabocha squash with pumpkin seed salsa, or braised lamb barbacoa. Diaz cooks the lamb in the traditional Hidalgo style, wrapped in agave leaves from his own backyard. Then there are the caseros tacos like fried cauliflower or seared queso fresco with bacon and Hatch chile, and a truly Mephistophelian spicy one (the Voodoo) with hunks of stewed habanero melded with honey salsa, chicken and cucumber.